Drought is a fact of life in California. Having lived here all my life I have observed a cycle that goes like this: It appears we may be in a drought, we are in a drought, we may be coming out of the drought, we are finally out of the drought. California is always somewhere in this cycle. That fact should keep us on our toes and trying to figure out how we can each use less water, and how to plan for the increase in demand that the projected 50% growth in the population of the greater Tehachapi Valley over the next 15 years, will present. We have heard it so often that I wonder if we have not become desensitized to the message. Yet, it does require a response from me, and from you. I have switched to low flush toilets, shower heads and faucets that use less water and practice turning off my faucet while I brush my teeth, etc… It is time to move from inside the house to the landscape, where I must figure out a way to use less water. The landscape is,by far, the biggest water guzzler for most every home. So how do we use less water, and still have a beautiful inviting landscape? I say that it is not only possible, but that we need to ask for more. Being a landscape designer I have given a lot of thought to my ideal landscape and it provides so much more while using less water. 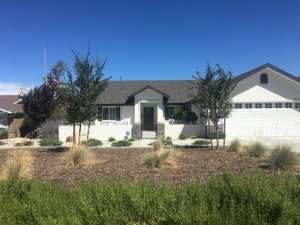 My ideal landscape brings nature to my home so I can observe and enjoy the fascinating creatures of the Tehachapi Valley from my window, or while I relax in my own back yard. It creates a relaxing and stress free environment for me and a garden refuge for birds and butterflies as well as all sorts of other little pollinators like bees and other beneficial insects. As an influx of more people reduces native habitat and water resources, I want my garden to be a refuge for some of the creatures that are being displaced, while using less water. How can I achieve this goal? The National Xeriscape Council has a 7 point strategy that can help you use up to 50% less water in your landscape. By combining their strategies with careful plant choices you can achieve a garden that does more good than you dreamed possible. 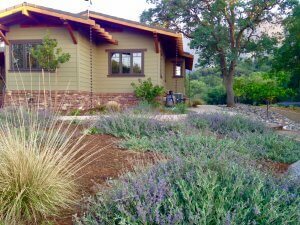 All beautiful, efficient water wise gardens begin with good design. Conserving water in the landscape can be maximized if it is considered in the initial planning stage. Make your first zone your “Oasis” by planning your highest water use zone where it is most appreciated and used. Right outside your door, literally on the perimeter of your house itself. As you move further from the house you can plan a transition zone that uses less water and farthest away from the house you can plan a low water use zone that can be populated with natives and plants that are adapted to very little water. Irrigation should be carefully planned for each zone so that the landscape is using each drop of water efficiently, with no excess runoff. Properly installed irrigation, on a timer, takes a lot of the headache and work out of maintaining the garden. Irrigation in the first few years is essential for almost every plant. After a plant makes it through its third summer it is truly established, then you can wean the plant back slowly, keeping in mind that most your plants will need some supplemental water for the life of the garden. Mulch is a term that refers to any material that is spread around plants to insulate the soil.It can be gravel or some type of bark, or shredded redwood (commonly called gorilla hair).This material is a workhorse in the garden, reducing erosion, moderating soil temperature, and reducing evaporation. You can combine mulch with a weed barrier cloth that will allow water and oxygen to pass through to the roots, giving you a great approach to suppressing weeds. To be successful with your gardening endeavor you must prepare the soil in the areas you are going to plant. This can mean tilling, and amending with compost to improve the soil in the oasis and transition water zone at least. Depending on the plant material chosen, and the soil in the planting location, you may be able to get away with just loosening the soil by digging the plant holes wide enough in the low water area. If your soil is really challenging contact your local UC extension office for information on where to bring a soil sample for testing. They can advise you of the laboratories that test soils for your area. Lawn has been a mainstay in American landscapes for decades. It can fulfill the needs of homeowners by cooling the local environment, reducing erosion and dust, and providing a play surface for children and pets. The choice of whether or not you need turf grass, and how much you need should be made after considering how you plan to use an area, what the benefits will be of incorporating turf, and then deciding how to use it in a limited fashion. It can be a main component of the oasis and should be used close to the house where it’s benefits can be enjoyed the most . As the demand for low water plant material has increased, so has the supply. Our local nursery has a great variety of plants that can attract wildlife pollinators of every type to your garden. This is where your garden can shine! You can provide for their needs by choosing plants that provide food for butterflies, hummingbirds, bees and other pollinators at their different stages of life. in addition you can choose to not displace some of the natives existing on your site. For example; on the fringe of your garden (in your low water zone) leave a few native milkweed that provide monarch butterfly caterpillars with food for their larval stage. Whether you plan to take care of the landscape yourself or have help from a gardener, maintenance must be planned for. Low maintenance is possible. No maintenance is not. Be realistic about the time it will take to maintain the landscape. 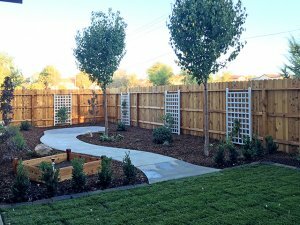 Pruning, occasional weeding and pest management as well as checking the irrigation system to see that it is functioning properly is the minimum maintenance for a well cared for yard. By following these guidelines you have the opportunity to create a low water habitat in your own landscape. The more diversity in the plant choices you make, the more different homes you provide for the type of wildlife that are so enjoyable to watch in your own garden. Bees and butterflies, hummingbirds and quail can be sheltered and nourished while your mind and spirit relax in the arms of nature. So lets ask more from our landscapes while actually using less of our precious resources, including water. Lets bring nature home to our water wise garden.